As North Korea's president pledges to "denuclearize" the Korean peninsula, an international team of scientists is publishing the most detailed view yet of the site of the country's latest and largest underground nuclear test on Sept. 3, 2017. The researchers—Teng Wang, Qibin Shi, Shengji Wei and Sylvain Barbot from Nanyang Technological University in Singapore, Douglas Dreger and Roland Bürgmann from the University of California, Berkeley, Mehdi Nikkhoo from the German Research Centre for Geosciences in Potsdam, Mahdi Motagh from the Leibniz Universität Hannover, and Qi-Fu Chen from the Chinese Academy of Sciences in Beijing—will report their results online this week in advance of publication in the journal Science. That explosion took place under Mt. Mantap at the Punggye-ri nuclear test site in the country's north, rocking the area like a 5.2-magnitude earthquake. Based on seismic recordings from global and regional networks, and before-and-after radar measurements of the ground surface from Germany's TerraSAR-X and Japan's ALOS-2 radar imaging satellites, the team showed that the underground nuclear blast pushed the surface of Mt. Mantap outward by as much as 11 feet (3.5 meters) and left the mountain about 20 inches (0.5 meters) shorter. "This is the first time the complete three-dimensional surface displacements associated with an underground nuclear test were imaged and presented to the public," said lead author Teng Wang of the Earth Observatory of Singapore at Nanyang Technological University. Putting all of this together, the researchers estimate that the nuclear test, North Korea's sixth and the fifth inside Mt. Mantap, had a yield between 120 and 300 kilotons, about 10 times the strength of the bomb dropped by the United States on Hiroshima during World War II. That makes it either a small hydrogen, or fusion, bomb or a large atomic, or fission, bomb. "SAR really has a unique role to play in monitoring explosions because it is direct imaging of the local ground surface, unlike seismology, where you learn the nature of the source analyzing waves radiating outward from the event at distant stations," said Dreger, a UC Berkeley professor of earth and planetary science and a member of the Berkeley Seismological Laboratory. "SAR provides some measure of ground truthing of the location of the event, a very challenging thing to get at. This is the first time anyone has actually modeled the mechanics of an underground explosion using satellite and seismic data together." "As opposed to standard optical imaging satellite imagery, SAR can be used to measure earth deformation day and night and under all weather conditions," added Dreger's colleague and co-author Roland Bürgmann, a UC Berkeley professor of earth and planetary science. "By precisely tracking the image pixel offsets in multiple directions, we were able to measure the full three-dimensional surface deformation of Mt. Mantap." According to Dreger, the new information suggests the following scenario: The explosion occurred more than a quarter mile (450 meters) below the summit of Mt. Mantap, vaporizing granite rock within a cavity about 160 feet (50 meters) across and damaging a volume of rock about 1,000 feet (300 meters) across. The blast likely raised the mountain six feet (2 meters) and pushed it outward up to 11 feet (3-4 meters), though within minutes, hours or days the rock above the cavity collapsed to form a depression. "There may be continuing post-explosion compaction at the mountain. It takes time for these aseismic processes to occur," Dreger said. 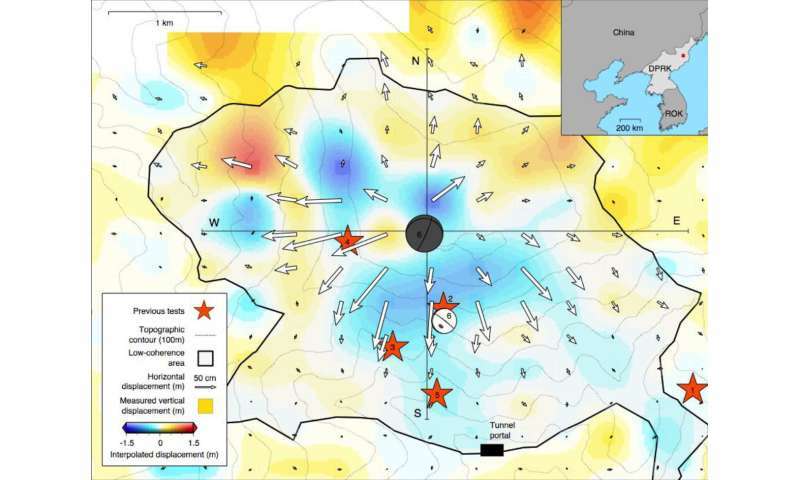 "I am hoping that by jointly analyzing the geodetic and seismic data, we will be able to improve discrimination between earthquakes and explosions, and certainly help with estimating the yield of an explosion and improving our estimation of source depth," Dreger said. "This study demonstrates the capability of spaceborne remote sensing to help characterize large underground nuclear tests, if any, in the future," Wang said. "While surveillance of clandestine nuclear tests relies on a global seismic network, the potential of spaceborne monitoring has been underexploited."